So how was January for you? Mine was, as they always are, grey, cold and strewn with coughs and colds. But, on the knitting front, I have been on fire! I have six finished objects to show off. Admittedly two were very well under way at the start of the month but I’m finishing the month with two well under way so I’m including them in January’s count. I also had a lovely meet up at Flock on The Plain with a group of ladies who are my woolly tribe. We call ourselves the Possiwools, after one of our members put a “possible wool meet up” in her family diary and her teenage son shortened it, and they really are the best sort of people. I want to gush on about them and tell them all how much I love them but I’m not sure I could do them justice. Maybe I’ll save that for another day. First off the needles was my Whitehorse Sweater by Caitlin Hunter of Boyland Knitworks. This is the second sweater of Caitlin’s I have made and I was as pleased with this one as I was with the first. The yarn was a lovely soft blue faced leicester double knit from The Uncommon Thread. I adore the finished piece and have worn it several times already this month. The next item finished was a pair of socks in Regia yarn in the pattern ﻿A Nice Ribbed Sock﻿. I don’t usually buy commercially produced yarn, preferring small independent hand dyers, but this, and a couple of other balls, fell into my basket after a lecture by Arne and Carlos about their life and home in Norway and their design inspirations. The pattern is my go to pattern for socks. I always worry that a plain sock will go baggy with wear, so the little bit of rib in this pattern provides a bit more ping back, and its not such a in your face pattern that it disturbs the colour of the yarn. Next to be finished were these socks for my mum. The pattern is the Diagonal Lace Sock from the book Socks from the Toe Up, and was my first toe up sock. I learned, as most people do, to knit stocks cuff down but always worried about knitting the leg too long and not having enough yarn to complete the toe, but with toe up, you just knit until you’ve used up your wool, or reach the leg length you desire. The yarn is a Merino/Nylon mix hand dyed by Norah George Yarns and the combination of yarn and pattern is so pretty, I stopped knitting often to admire them. They would have been finished a lot soon had they been less pretty! Also knitted this month was this cute hat for my little boy. Obviously my little boy already had a lovely hand knitted hat but this was “lost” at some point over the Christmas holidays, so he needed another. I won’t dwell on the fact that, a few days, ago, I found the missing hat, at the bottom of the hat basket, presumably where it had been all the time. This hat was a super quick knit in an aran weight yarn that I dyed myself. The yarn is a Merino/Donegal Nep mix (I just love all this little woolly neps) and the pattern was my own Curlew pattern, although I did a modified brim and crown decrease. The next finished item took a lot of knitting. It’s a wrap made using a Thirty Shades pack I bought as a 6 month club yarn from Jo Knit Sew last year. 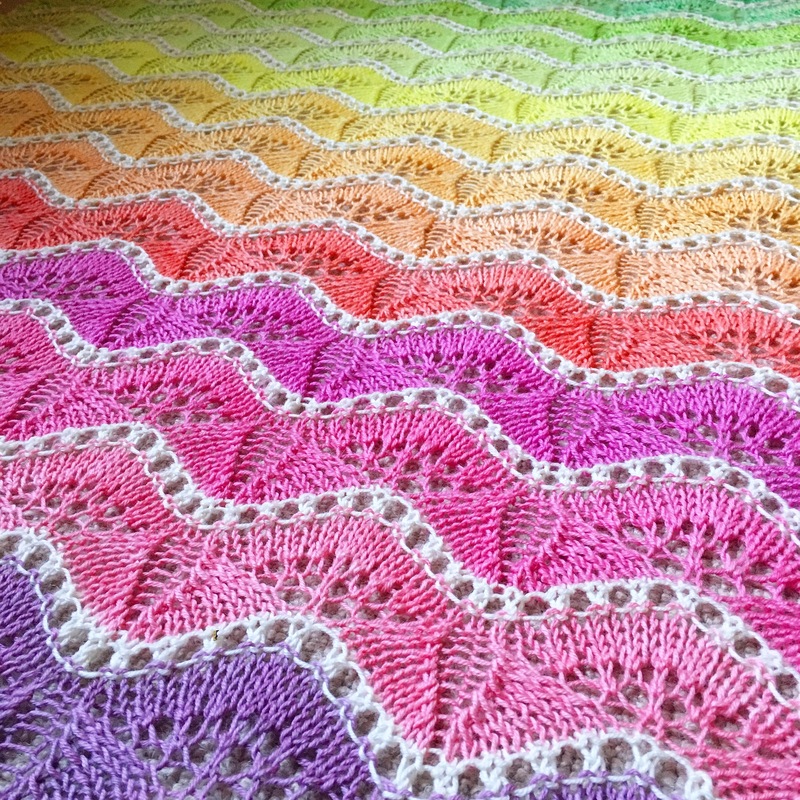 I’d been on the look out for a pretty knitted pattern, that would do justice to the yarn, for a while and knew I’d found the one in Melanie Berg’s True Colours. However, I had 30 colours to work through and so the shape of Melanie’s shawl wouldn’t have worked, so I took the repeated pattern from her chart and used that to create a rectangular wrap. It really is one of the most beautiful things I have ever made. Light and airy with the lace work but, at the same time, warm and cosy as its made in a light double knit weight merino yarn, and all the colours of the rainbow. I’ve yet to get a decent photograph (good natural light in my cottage is non existent in January) so here is a picture of it on the blocking mats. I’ll post more pictures when light levels improve! Last to be finished were my Polgooth Socks in Blacker Yarns Classic Double Knit. These socks are incredibly special to me as they represent the first item I have made in wool grown, spun and dyed in the UK. The wool is a mix of white fleece to which Hebridean, Black Welsh Mountain and Blue Faced Leicester are added, and after all the super soft merino I’m used to, the texture of this yarn was challenging. I knitted the first sock and it was so stiff I was really worried so, before I knitted the second, I washed and blocked the first, and, what a difference that made. The knitted sock became soft and squishy and a pleasure to wear. The socks fit really well too and the gusset decreases are so lovely to look at, its a pity they are hidden in my shoes. So, that was my January. I can’t promise to keep up this blistering pace throughout February but I have plenty of patterns and yarn already lined up for future projects so you can be sure my needles wont be idle. And before I leave you I wanted to wish you a good Imbolc. This is, according to Wikipedia, an Irish Gaelic traditional feasting festival, celebrated at the beginning February, marking the beginning of spring. I’ve been noticing some signs of the start of a change in the season; the snowdrops are out in perfusion in our valley and I realised, with thud of joy in my heart, when I closed the curtains at 5pm last week, that it wasn’t yet completely dark. The long light nights of summer are returning. I imagine our ancestors noticed these things too and it gave them good cheer. Happy Imbolc!